It’s a trendy, thriving neighborhood filled with unique shops, cafes, eateries, green space, and people. It’s the perfect point of departure for exploring the neighborhoods of San Francisco by bicycle. 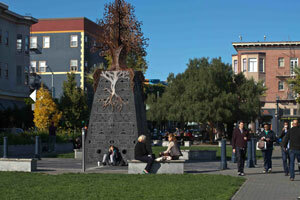 We are one of a few small businesses in Hayes Valley’s Proxy Development, a unique experiment in urban design and city planning. Each shop in Proxy is made of shipping containers. Once filled with manufactured goods, these containers are now filled with ice cream, beer, bikes, coffee, and people! For directions, please see our Location page. Need suggestions for before and after your bike tour or bike rental? Check out our Before and After page. 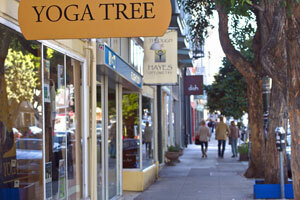 After your bike ride, stroll down Hayes St. to check out the best of shopping local. Patricia’s Green: Where people and dogs meet.